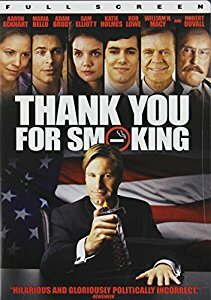 In class we watched the movie, Thank you for smoking. You were asked to keep track of arguments/claims made in the movie along with some context as to when and where the claims appeared. Your assignment is to write an argumentative essay using those claims. The movie was a satirical look at how we advocate for our position even justifying something like smoking. This was not a movie promoting smoking – it was SATIRE. Do not write me an essay about the dangers of smoking that is NOT the assignment. A minimum of three claims made in the movie. Describe the context (what was happening in the scenes), list the grounds (reasons for their claim, minimum of two from the movie) and the actual claim. Timing - Essay is due at the beginning of class. Papers will not be accepted if you come into class late. Papers must be 4 pages long – cover page, and three full pages of text, typed, double spaced with an acceptable font no larger than 12 pt. Points will be deducted for papers that do not meet the above standards.